NYC Mayor Bill de Blasio talking with Gov. Andrew Cuomo's daughter, Cara Cuomo, before the State of the State address at the Empire State Plaza Convention Center Albany, NY Jan 13, 2016. 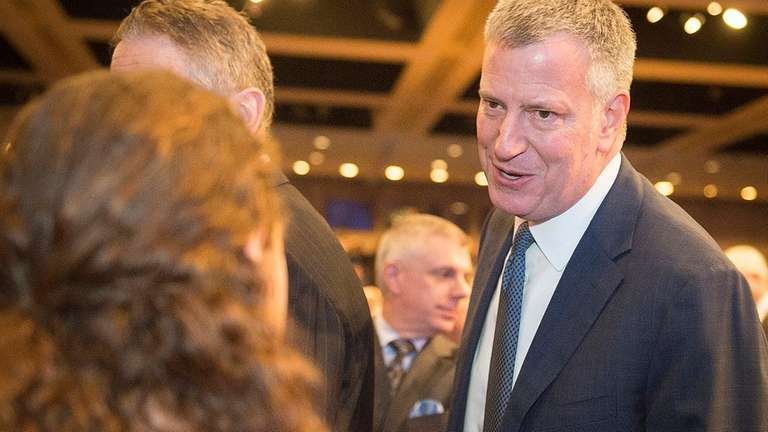 Photo Credit: Newsday / J. Conrad Williams Jr.
Mayor Bill de Blasio said Thursday that he will do “whatever it takes” to fight the hundreds of millions of dollars in new costs that New York City would incur for Medicaid and CUNY under Gov. Andrew M. Cuomo’s budget proposal. The Democratic mayor, who had expressed some concern Wednesday after the governor unveiled his budget, took a more forceful stance following a closer review of the financial blueprint. Cuomo spokeswoman Dani Lever said a response to the mayor’s comments is forthcoming. The mayor said he expressed his concerns to the governor Thursday morning. The two met in person for half an hour in Albany Wednesday, and de Blasio after Cuomo’s State of the State commended some of the governor’s other proposals including more resources for housing and homeless services. Under Cuomo’s budget plan, the state would decrease its contribution to the City University of New York and the city would take on 30 percent of the costs, in proportion to the number of appointments it has on the college system’s board. The city would also pay for its increases in Medicaid expenses.